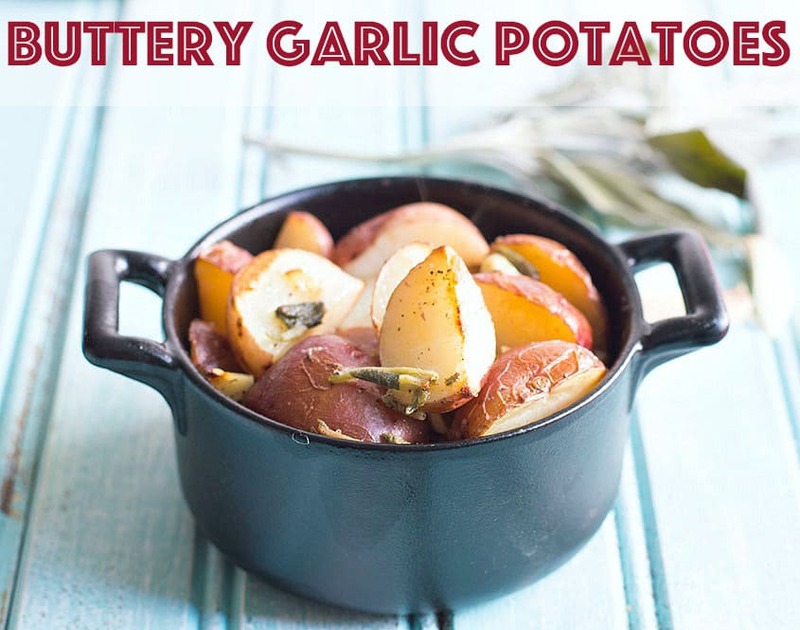 Garlic Butter Potatoes – This post is sponsored by REVOL. All opinions expressed here are my own. Whenever I see potatoes, I have to stop and drool for a few minutes. You know what I am talking about, right? Potatoes have a hypnotic power on anyone. Even the strictest of diet followers cannot help but be mesmerized by potatoes. It could in the form of wedges, baked, smothered , roasted, Curried or drenched in cheese, potatoes can be all consuming. Personally, I am happy to surrender to its power occasionally and make a drool worthy meal from it. So, when Revol sent me these individual covered dish casserole made of porcelain, All I could see was delicious, aromatic potatoes slow roasting in them. Ever since I made this Wonton ravioli, I have been obsessed with Sage in butter. Sage butter and potatoes are a match made in foodie heaven! To round out the recipe, I added copious amounts of garlic. 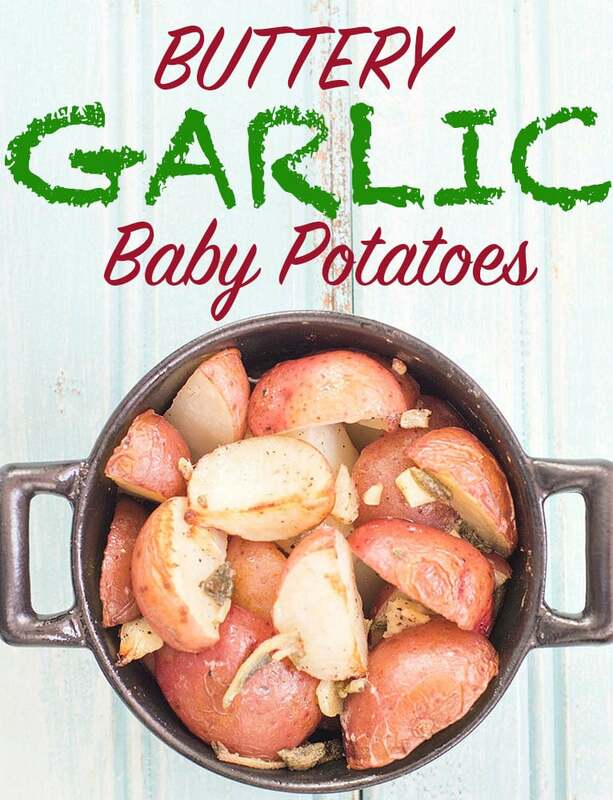 In each casserole, I added about 4 baby potatoes and 2 cloves of garlic. With the combination of Sage butter, salt and pepper, this meal makes a loud statement! 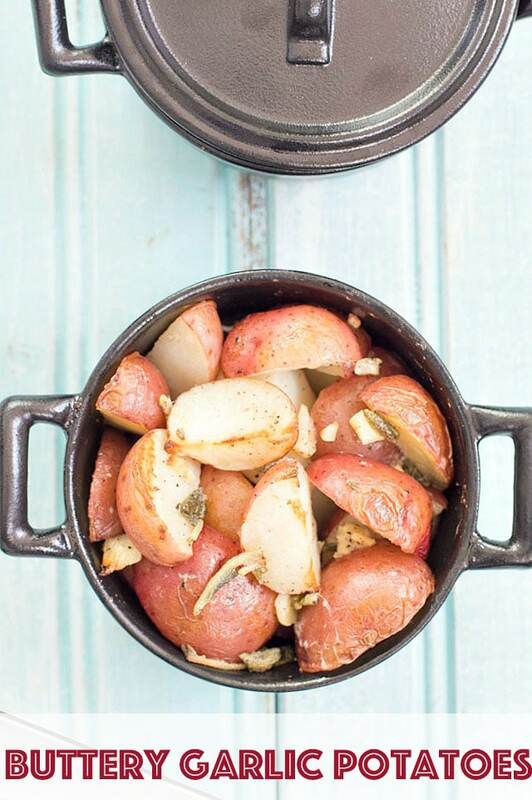 Oven roasted red potatoes make the perfect side dish to any meal. I think they will end up on my Thanksgiving Feast this year. 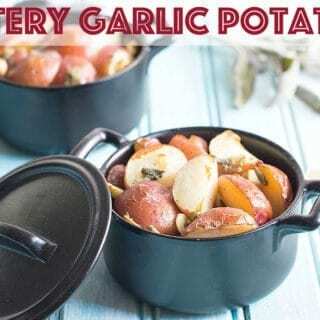 The porcelain (looks like cast-iron) ensures that the potatoes are cooked evenly and cooked all around because it distributes the heat evenly all over. The best part about these pans is that they are super easy to clean. The food doesn’t stick to the bottom or sides and all I need was soap + a soft sponge to clean them. For a person who is infinitely lazy when it comes to doing the dishes, these ceramic pans are exactly what I need. Don’t be surprised it you see new potato recipes show up frequently on the blog! If you love working with sweet potatoes, check out my 5 tips on how to cook them to perfection. What is your favorite way to cook potatoes? 2) Take 8 baby potatoes and wash them thoroughly. I don’t remove the skin from the potatoes because it is a personal preference. If you prefer skinless potatoes, go for it. 10) Bake in the oven for about 15 minutes with covered lid. Then, remove the lid and bake for another 5-7 minutes until the potatoes start to brown on the white part. 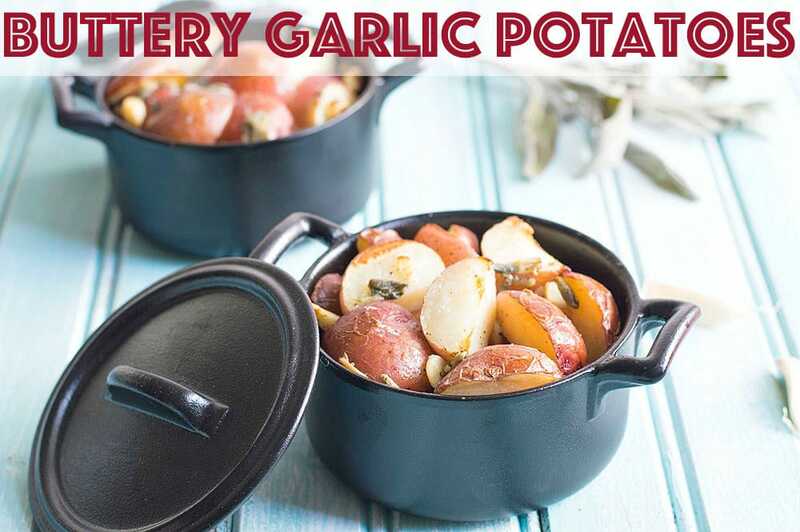 11) Remove from the oven and serve the garlic butter potatoes in the pan. Trust me, that is the best way to keep them warm and delicious. Bake in the oven for about 15 minutes with covered lid. I don’t eat potatoes but these look great. I might try it for my family though. ? butter and garlic? I’m in! That’s all this girl needs is butter and garlic! Oh my gosh they look so delicious! I am going to try this tonight, thanks for sharing! Thank you, Anita. They are my favorite comfort food.